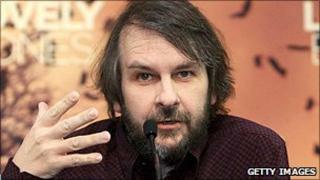 Image caption Peter Jackson said the film was "a big fat juicy target"
Film-maker Peter Jackson has warned that production on The Hobbit movies could cease over a pay wrangle with acting unions. The Lord of the Rings director, who is the films' executive producer, said it faced being shut down or moved from its location in his native New Zealand. In an open letter, Jackson said shifting the entire project to eastern Europe "could so easily happen". Unions have urged actors not to work on the films due to the dispute. A number of organisations based in the UK, Canada, Australia and the US have said the The Hobbit's producers have refused to negotiate a deal with them. The International Federation of Actors said it was time for performers on The Hobbit to seek union contracts, adding that actors in New Zealand have "struggled on non-union contracts for some time". Jackson said the wrangle was a "grab for power" and "an attempt by the "Australian bully-boy" to exert influence over New Zealand's film industry. "It feels as if we have a large Aussie cousin kicking sand in our eyes... or to put it another way, opportunists exploiting our film for their own political gain." "Seriously, if the Hobbit goes east (Eastern Europe in fact) - look forward to a long, dry big-budget movie drought in this country," added the film-maker. Jackson said that he is not anti-union and "has always attempted to treat my actors and crew with fairness and respect". He pointed out that Hobbit actors with no union representation are part of a profit-sharing pool. The director made all three of the Lord of the Rings films and his screen adaptation of The Lovely Bones using New Zealand locations. Jackson is expected to become the films' director after the departure of Guillermo del Toro due to concerns over delays - although a formal announcement has yet to be made. But the two-movie project has not been given the financial go-ahead by Hollywood studios New Line and MGM. Work was expected to start earlier this year but is now scheduled for a 2011 start.